At the beginning of the 1930s, the USAAC had realized that the development of the biplane had reached its zenith, and it was time to progress to monoplanes as pursuit aircraft. With the introduction of the Boeing B-9 monoplane bomber in 1931, the USAAC was faced with the fact that its new generation of bombers were faster than its current stable of biplane fighters. While the Fokker Eindecker E.III monoplane fighter had been introduced during World War I, the general consensus was that monoplane fighters were not strong enough to meet the demands required in combat. However, developments in engine technology and the requirements of faster aircraft, required a shift in strategy and compelled the USAAC to seek more advanced designs. The Boeing P-26 Peashooter was first step of this concept, as it was the first all metal, pursuit monoplane, for the USAAC. However, it was conservative in design, with fixed gear and external wing bracing—although the P-26 would prove to be a gallant fighter against Japanese aircraft, in the Philippines, at the beginning of World War II—it was for the most part, an interim aircraft.1 As the-mid thirties approached, the USAAC held a competition to develop a replacement for the P-26. In 1935, Curtiss, Seversky, and Northrop submitted aircraft for a USAAC design competition fly-off. These aircraft would usher in a completely new era of American fighter designs and concepts with enclosed cockpits, retractable landing gear, all metal construction, hydraulic systems and more powerful engines. Seversky entered a fixed-gear, two-seat SEV-2XD fighter, but switched to the single-seat SEV-1XP, after eyeing the Curtiss Model 75 and Northrop 3A, both of which had retractable landing gear. The switch by Seversky was allowed since it was badly damaged, perhaps deliberately, on the way to Wright Field to the competition on June 18,1935.2 This drew protests from Curtiss,3 but the final fly-off was postponed until April 1936, after the Northrop 3A crashed into the sea. The delay allowed Seversky to modify its entry, with a different tail-plane and engine, designating it the SEV-7, while Vought submitted a rebuild of the Northrop A3 as the V-141. Consolidated now entered the competition and submitted the P-30, while Curtiss submitted the Model 75, with a new Wright XR-1820-39 Cyclone engine. The Seversky Aircraft Corporation won the USAAC's competition, and Curtiss was awarded a contract for just three examples of their design, to be powered by a derated version of the 1,050-hp (783-kW) Pratt & Whitney R-1830-13 Twin Wasp radial engine to be used for test and evaluation under the designation Y1P-36. Although the P-36 failed to emulate the performance of contemporary fighters being developed at the time such as the Messerschmitt Bf 109 and Hawker Hurricane, it was the principle US Army fighter until 1941.6 This was an era of fighter development where designers had not yet realized the full potential of the radial air-cooled engine. At a later date an attempt was made to upgrade the Model 75 with the installation of an Allison V-1710 engine, but the prototype and a batch of service test YP-37s with the V-1710-21 engine failed to achieve a sufficiently high standard of performance and were in any event, superseded by the Curtiss P-40. 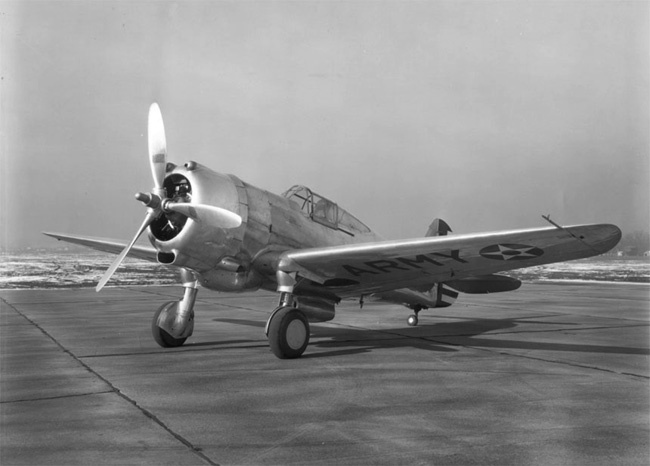 By comparison with the original Model 75 prototype, the Y1P-36 was much improved with increased fore and aft cockpit visibility and the introduction of a retractable tail wheel. Service testing of the Y1P-36s was considered so successful that a contract for 210 production P-36As was awarded on July 7, 1937. This was the largest US military order since the first World War.7 Delivery began in April 1938, but by the time the United States entered World War II, the P-36 was already obsolete. Circumstances compelled limited use of P-36As in the opening stage of hostilities with Japan at Pearl Harbor, but they were very soon relegated for use in a training role. They were no match for Japanese Zeros. Variants included a single XP-36B with a 1,000 hp (746-kW) Pratt & Whitney R-1830-25 Twin Wasp engine, and the last 31 of the original production run were completed as P-36Cs with a more powerful Twin Wasp. The designations XP-36D/-36E/-36F were applied to experimental examples with differing armament. 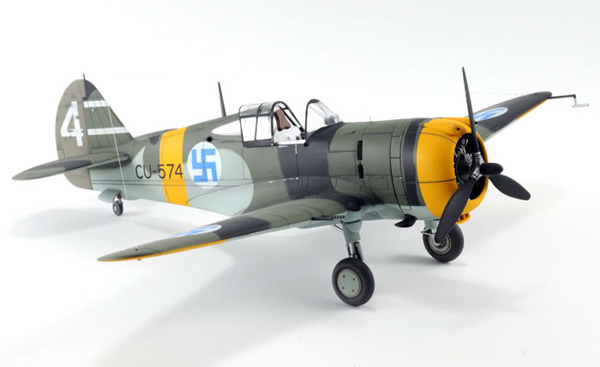 A Model of a Hawk 75A-6 with Finnish markings. 1,200 hp (895 kW) air-cooled, radial engine. one .50 caliber machine gun. Four 7.5 mm FN-Browning machine guns. 2. David Mondey. American Aircraft of World War II. New York, Smithmark Publishers, 1996. 213. 4. Peter M. Bowers. Aircraft In Profile, Volume 4. The Curtiss Model 75. Surrey, England; Profile Publications Ltd., 1968. 82. 6. Peter M. Bowers. Curtiss Aircraft, 1907 - 1947. Annapolis Maryland: Naval Institute Press, 1987. 348. 1. Kenneth Munson. Fighters Between the Wars, 1919-39. New York, The Macmillan Company, 1960. 156-157. 2. Enzo Angelucci and Peter M Bowers. The American Fighter. Mila, Italy; Haynes Publishing Group., 1987. 384. Created June 12, 2007. Updated October 17, 2013.